Now only $34.99 - Less than the cost of one riding lesson! Arranged in Lessons 1-4, Janel Brookshire teaches the basics from the ground up: safety and handling, grooming, tack and, of course, riding. Lessons provide thorough explanations and examples, featuring both adult and youth riding students with varying experience. The riding portions teach a deep and balanced seat, and are broken down into the walk, trot and lope. Safety is stressed through all lessons. Perfect for beginning and novice western riders. Also includes bonus sections on buying your first horse, buying tack and hauling your horse. Running time is approximately 2.5 hours. A companion to the video, this gives the basics in print and photographs. Very thorough explanations of this riding style and important information on horse behavior as it relates to riding. Includes lots of step-by-step pictures and examples, as well as extra information on buying a horse and tack, and loading and hauling your horse. Over 150 pictures! For a 15% discount, order the video and manual combination. Have it all at your fingertips, both on screen, and while you%u2019re out with your horse. as well as tack selection. make you a better rider. 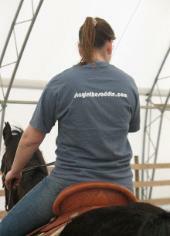 Contact us for information on Stay in the Saddle Apparel. Manuals are out of stock.